It’s very shallow and so warm it’s like swimming in the bath tub, there is no coral or anything to snag on, and the bottom is made up of white fine sand that just slips between your toes. 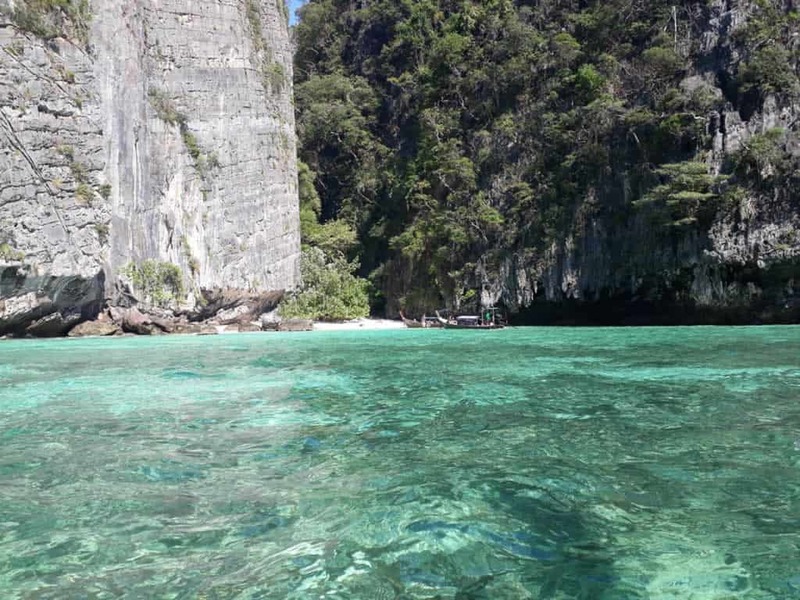 Very close to Viking Cave (another great tour to take) Pileh Lagoon Phi Phi Island is a wonderful place to relax and have lunch in-between dives or snorkeling sessions here in Phi Phi Island. 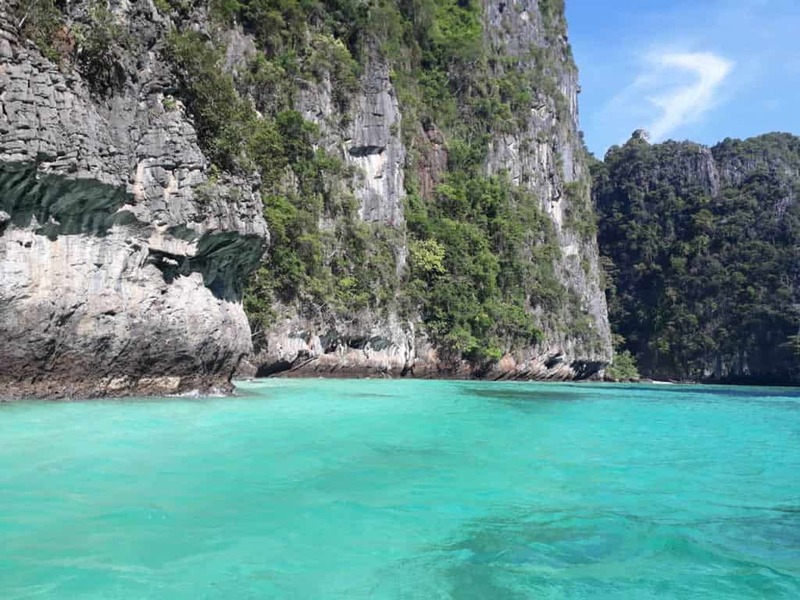 Private Phi Phi Island Tour Snorkelling & Sightseeing at the Top Spots that will make your holidays in Phi Phi Island unforgettable. 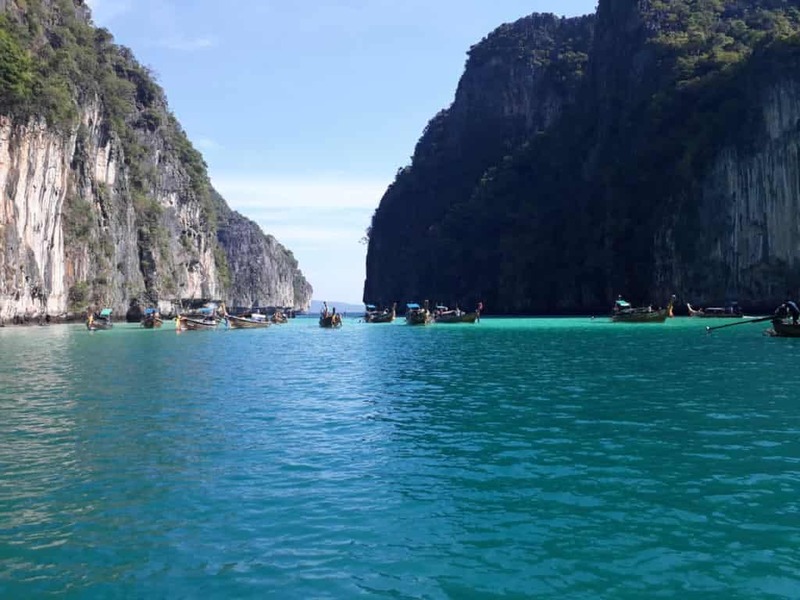 Get away from the Crowds with a Private Tour around Phi Phi Island. 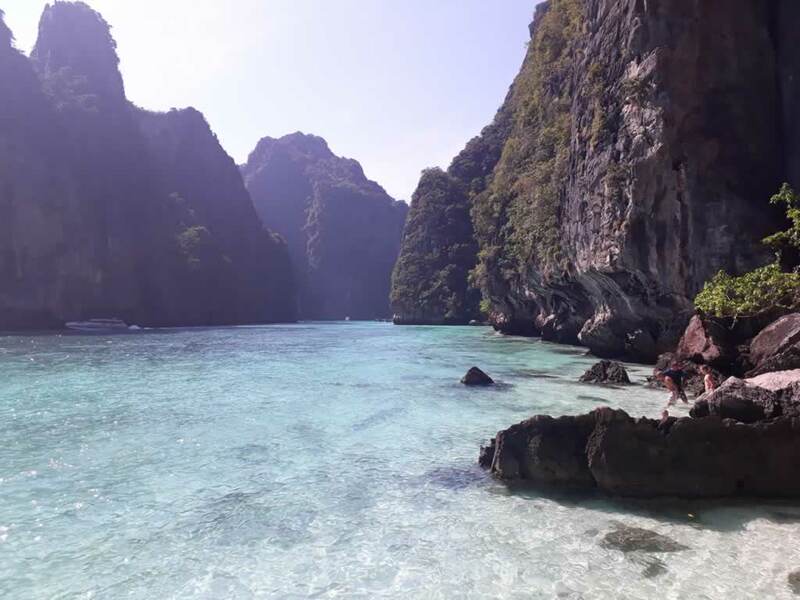 Pileh Lagoon surprisingly is never too busy, as most of the tourists wish to see the much more famous Maya Bay. 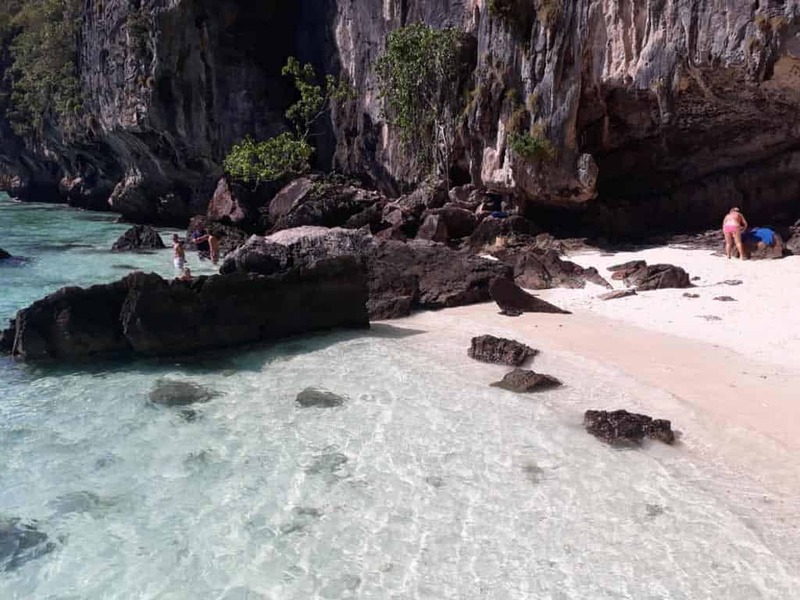 Pileh lagoon is very different from its neighbouring bay, in fact more beautiful, as Maya Bay can get too busy with speedboats whizzing about, Pileh Bay offers a much more relax and gentle way to while away a few hours. The views at the lagoon are really incredible, the turquoise water colour with its limestone walls cliffs surrounding them. The stunning lagoon (locally believed to be an offering from Buddha) a place where people can relax and daydream the day away. You will be welcomed into the water by thousands of colourful Sargent Major Damsel fish, they don’t bite they just want to see if you have anything that they may be interested in. Other fish you can see here are Rabbit fish, Rainbow and Moon Wrasses are also very inquisitive and will come to check out the snorkeler. The lagoon is surrounded by sheer limestone cliffs, looking up here; you can see the rickety bamboo scaffolding running up many of the walls. To the untrained eye these are just old pieces of bamboo on the side of a cliff. The truth is very different; these wiry bamboo branches are used by local men who climb up the poles to collect birds’ nests. The birds’ nests are very difficult to gather resulting in the price for birds nest soup being some of the most expensive food in the world. The birds are Swallows and can been seen everyday dive bombing off the cliffs. They nest in January, the nest collectors will then take the first and second nest that the mating pair build to sell on the open market, the birds will then build another which will be left alone so the pair can breed and then raise their chicks in piece. Just before the entrance to Pileh Lagoon there is a cave that the locals call Viking Cave. Inside the cave are very old paintings on the walls of what really does look like European sailing ships. Whether they are of actual Viking ship remains to be proved. Anthropologists have failed to fully explain how these images came to be, the truth is nobody knows what they represent or who even painted them and when or why. 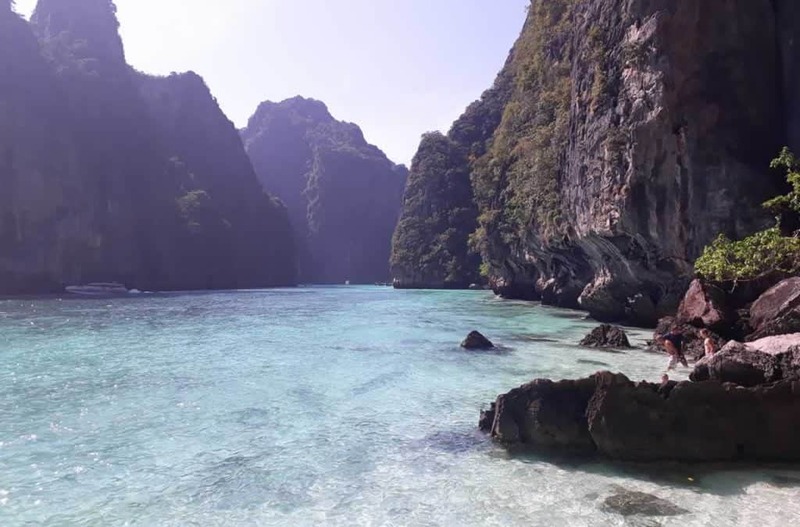 Viking Cave is a large opening slightly above water level on Phi Phi Leh. 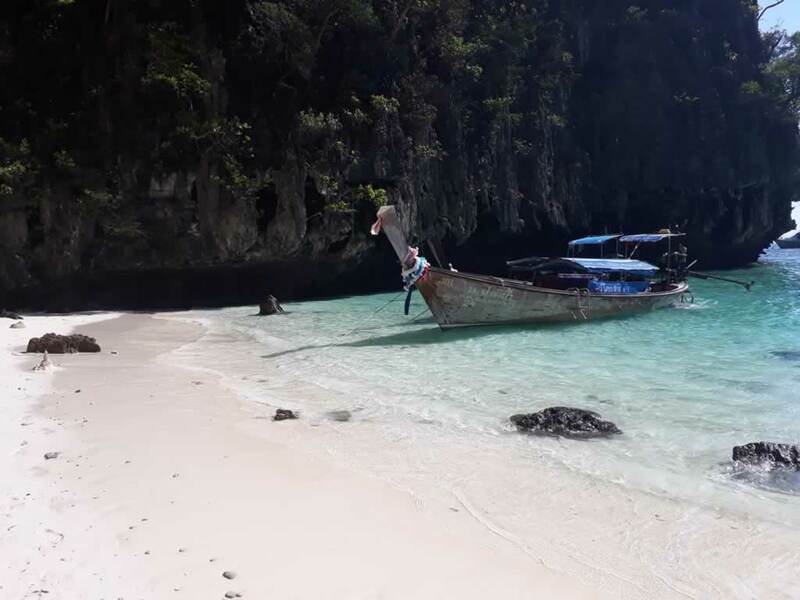 To access this cave you can rent a long tail boat or speedboat which will pull up to the yet more rickety bamboo poles, then you can clamber onto the little wooden decking at the cave mouth. It is well worth a visit, the scenery is absolutely amazing, and a real eye opener and maybe you can shed some light on the cave painting.